Henshaw, Marvin, head-of-household, age 25, born in Iowa; [parents birthplaces unspecified]; first married at age 19; rented home ($24 rent); no radio in home; occupation: laborer, odd jobs; not a veteran. 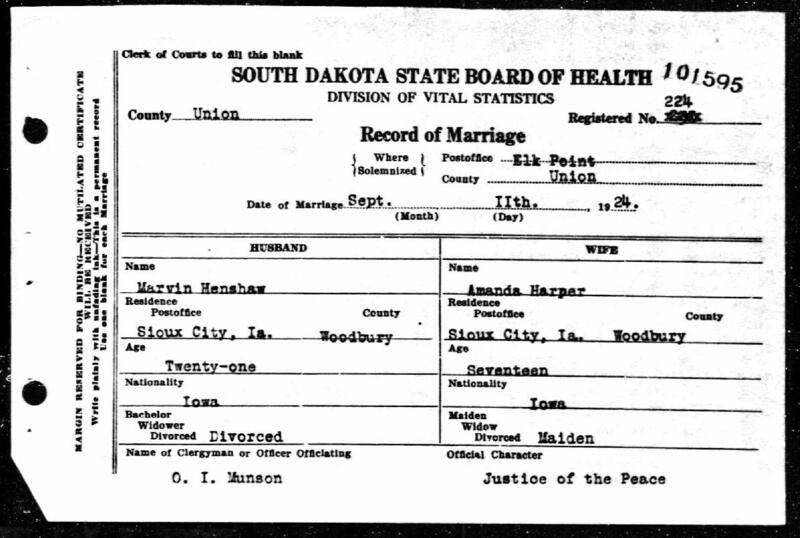 Henshaw, Amanda, wife, age 23, born in Iowa; father born in Missouri; mother born in Iowa; first married at age 17. Henshaw, Howard, son, age 5, born in Iowa; parents born in Iowa. Henshaw, James, son, age 3 years 5 months, born in Iowa; parents born in Iowa. Henshaw, Edward, son, age 1 yeard 6 months, born in Iowa; parents born in Iowa. Henshaw, Marvin A, head-of-household, age 34, born in Iowa; completed 8th grade; on Apr 1 1935 was living in Sioux City, Woodbury County, Iowa; rented home ($23/month rent); occupation: labor, city street division; worked 41 weeks in 1939; $1070 wages in 1939. Henshaw, Amanda F, wife, age 32, born in Iowa; completed 1 year of high school; on Apr 1 1935 was living in Sioux City, Woodbury County, Iowa. Henshaw, Howard C, son, age 14, born in Iowa; completed 6th grade; on Apr 1 1935 was living in Sioux City, Woodbury County, Iowa; attended school. Henshaw, James A, son, age 13, born in Iowa; completed 5th grade; on Apr 1 1935 was living in Sioux City, Woodbury County, Iowa; attended school. Henshaw, Edward H, son, age 11, born in Iowa; parents born in Iowa; completed 4th grade; on Apr 1 1935 was living in Sioux City, Woodbury County, Iowa; attended school. Henshaw, Mary Jane, daughter, age 9, born in Iowa; completed 3rd grade; on Apr 1 1935 was living in Sioux City, Woodbury County, Iowa; attended school. Whittaker, Paul, lodger, age 39, born in Illinois; completed 2 years of high school; on Apr 1 1935 was living in the same place/city; divorced; occupation: labor, W.P.A. ; worked 52 weeks in 1939; $624 wages in 1939. 1910 census, 8th Ward, Sioux City, Woodbury County, Iowa; roll T624-430, ED 214, page 278A, line #36, dwelling #168, family #169. South Dakota, Marriages, 1905-2013; http://www.ancestry.com.